Want to experience what it’s like to shoot two-hundred rounds in 1.3 seconds? Or maybe you’d prefer to crush a car with a battle tank? No matter your weapon of choice, you’re sure to find what you’re looking for at Battlefield Vegas. 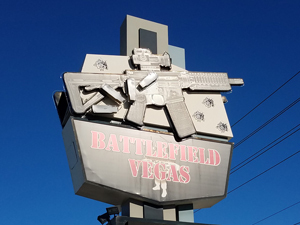 Battlefield Vegas is the area’s number one attraction with more than 350 weapons to choose from. The military-style complex can be found just one block off the Las Vegas strip. You’ll also have the opportunity to visit one of several outdoor training areas aimed to give you a realistic first-person shooting experience. 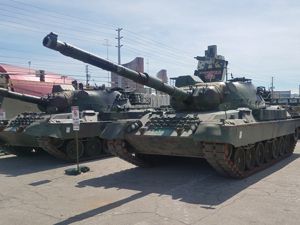 If you’re interested in weaponry, military history, or simply want to experience something new and interesting, head to Battlefield Vegas. 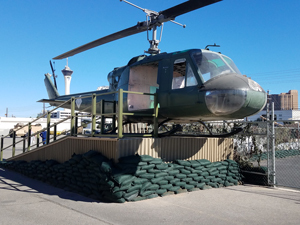 Open daily from 8:30 AM until 7:30 PM, Battlefield Vegas is the ultimate activity for bachelor parties, birthday celebrations, or just an afternoon out with friends. Customers can find weaponry from all eras, ranging from World War I to the weapons currently used by NATO forces in Afghanistan and Iraq. The hundreds of authentic military pieces are not only fun to shoot, but also to learn about. Bring along a camera and photograph a fleet of more than 25 military vehicles, such as aircrafts, 5-ton troop carriers, helicopters, and HMMWV (Humvee’s) which have been used in combat since Vietnam. Battlefield Vegas is a veteran owned and operated business. 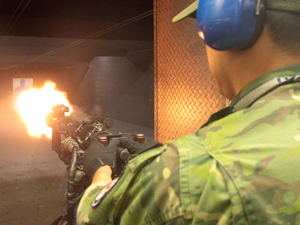 The establishment offers a state-of-the-art 25-yard indoor firing range as well as more than 200 acres of desert training areas where customers can come and shoot fully-automatic machine guns. Check out the selection of unique packages, ranging from the popular Black Ops Gamer Experience to the Counter Strike Extreme Package. There are options for every interest and budget, whether you’re new to shooting or a seasoned pro. You also don’t want to leave without trying the Mini-Gun, also known as the M-134. This weapon fires over 4,000 rounds a minute and has been used by the U.S. Forces from Vietnam to today. No reservation is needed to visit Battlefield Vegas for a few hours of fun. If you wish to be picked up at your Las Vegas hotel by an authentic U.S. military HMMWV (Humvee), call two hours before you want to shoot to request pickup. If you plan on coming with a group, book your visit at least 72 hours in advanced. The Humvee pickup is a complementary service which can accommodate from 3 up to 12 guests. If you have more people in your group, request a convoy to pick up your guests. Pickup is available at any Las Vegas Strip hotel or any hotel in the downtown and Fremont area. In addition to endless shooting opportunities, Battlefield Vegas also offers a one-of-a-kind experience. Crush a full-sized car with a M1A1 Abrams Main Battle Tank, which was once in service in the British Army as a Chieftain Mk8. Also ask about the Early Bird and Happy Hour specials. The Early Bird special gives customers a 15 percent discount on all packages if you purchase by 9:30 AM. The Happy Hour special is offered Monday through Friday and begins at 5:30 PM and ends at 6:30 PM. Online orders cannot be discounted. If you’re looking for something to do during your time in Las Vegas, you’ll want to check out Battlefield Vegas. Named the #1 new interactive entertainment attraction in Vegas, the shooting range/training areas offer a full day of shooting, fun, and excitement for the entire family. Even children as young as 10 years old can shoot when accompanied by a legal guardian. Get behind the weaponry of your choice at Battlefield Vegas.